Many of us are missing the point of just because it is on the menu does not make it a legal document. Would it be different if on the menu it had a place for you to sign to the agreement of a gratuity? I think then it may become legally binding. Just because it is on the menu means nothing. Let us replace the words “18 percent gratuity added to check of parties of 6 of more,” with “mandatory purchase of Micheal Jackson CD added to check of parties of 6 of more”. Who here would still feel they are bound by the menu to purchase that CD? If this is how it worked every politician in the US would own a restaurant. Mandatory tips can lead to poor service. Better for the business just to pay the wait staff 18% more, and fire them for poor service. Plenty of eager people looking for work these days. I believe that a reasonable person would think a gratuity is still a gratuity even if it’s added to the check. A reasonable person would think that the 18% calculation was performed as a courtesy for the mathematically challenged. Nal: The menu states: “18 percent gratuity added to check of parties of 6 of more,” There is no indication that the gratuity is mandatory. I think the students have a libel suit against the restaurant for claiming theft of services. But then, IANAL. jonathanturley: Nal: When you start proofing the menus referenced in stories on the blog, I have to throw down the flag. Don’t I give you enough business? LOL 🙂 Srsly, a match made in heaven. Keep up the good work, both of you. Emphasis added but if you don’t like the definition you can take it up with Webster’s. Pay attention to the fact that “voluntarily” and “obligation” are words with specific legal definition and use. 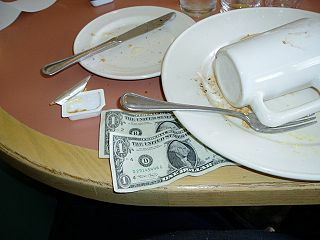 Given that is the definition of gratuity, a reasonable person most certainly could consider any gratuity optional contingent upon satisfaction. The patrons should not have been arrested because according to them, the services justifying the mandatory gratuity were not provided. Business has been lean lately and I have to stay sharp. There’s a lot of competition. AY and Byron are quick. The menu states: “18 percent gratuity added to check of parties of 6 of more,” There is no indication that the gratuity is mandatory. I think the students have a libel suit against the restaurant for claiming theft of services. But then, IANAL. When you start proofing the menus referenced in stories on the blog, I have to throw down the flag. Don’t I give you enough business? The relevant question is what the patrons had agreed to. The restaurant used inconsistent words — “mandatory” and “gratuity” — but this does not necessarily create ambiguity. If I had been a patron, I would have understood “mandatory” as the operative word, and “gratuity” to be inaccurate. I think, pace Alan, that the students did agree in advance to pay the 18 percent. Well I have never seen such disgruntled people in all of my born days. Cheap skate children they are depriving me of my hard earned money. There is no problem with that logic. It seems to me that paying something labeled “gratuity” or “tip” is optional, not required. The restaurant can add it in if they want, but no patron contractually agrees in advance to pay it simply because the restaurant will be adding it to the bill. If the restaurant had stated they would be adding a “service charge”, I think it would present a different question, but when labeled “gratuity”, I fail to see how this can be considered a theft of services. I presume that they deducted if off of the bill and paid the amount plus tax. Wow something wrong here. The steal mill is at work here. Not that Andrew Carnaige would have objected to skipping a tip either. Something oxymoronic about an automatic gratuity.